We visited several dealers In Florida, Georgia, and Tennessee. YOU ARE THE BEST SALESPERSON WE HAD! Knowledgeable and had a great attitude. We had a nice buying experience. The price was VERY GOOD and we are satisfied customers. Our buying experience at your store was exceptional. You were friendly, helpful, and answered all our questions, and were very easy to deal with. We would highly recommend you and your store to all our friends. My first stop was the Internet where I found the fine video of Roger, speaking articulately about his beautiful pianos and his business in Hanover. I called and was delighted when Roger answered. Even though it was Sunday morning, I left immediately for Hanover. From my first visit, Roger shared his immense knowledge about the science and art of pianos. He patiently showed me the difference in pianoactions, bringing the tiny scale that tuners use to measure the down and up weights of individual keys. Pianos are evaluated in terms of tone and touch. Roger and I share the thought that touch may be the more important characteristic, in part; because tone can be coaxed once the touch is there. I loved his expertise, and I left that afternoon, after a couple of wonderful hours, with a deeper appreciation of this miraculous instrument. I spent the next week doing a great deal of research online, reading everything I could on different pianos. The Internet now provides video clips of many different pianos, being sold all over the country. One could hear the different tones, even amongst various pianos of the same make and model. I quickly realized it was partly about being educated and largely about falling in love. I shopped other local dealers, and I wanted to return to Roger’s Piano. On my second visit, I had a better appreciation of what I was seeing. On that visit, I kept gravitating to one specific piano, a twenty-year-old baby grand Schimmel. It was a little higher than I had expected to go, but the piano, touch and tone, was exactlywhat I dreamed of owning. It took only two more days, of scouting other pianos in other showrooms, to know that it was the Schimmel that was going to join our family. Furthermore, I was delighted that the piano I wanted was Roger’s! I am totally satisfied with the quality and price I paid. Roger has been generous and gracious from the first time we met. He has given freely of his time. He educated and encouraged me. He provided additional information and was never intrusive in any way. When I purchased the Schimmel, he offered to correct a small irregularity in several bass key covers, and he ended up putting in a considerable amount of extra time in order to make the keys perfect! In removing the action to adjust the key covers, he discovered an additional adjustment that significantly improved the sustain pedal. Not only did these slight changes thrill me, I could tell that they were exciting for Roger as well. A perfectionist, he loves these magnificent pianos, and it shows in everything he does. Roger’s extensive knowledge was evident, and I loved everything he shared. I learned about touch and balance. I now have a better appreciation of the workings of a piano, so even the prospect of an upcoming tuning is exciting. Roger feels like a friend. I hope to stay in touch in the months and years to come. He understood, the first day I visited, that I yearned to return to playing after a hiatus of nearly fifty years! Never did he push me to play…I was very shy and hesitant…so, in order to put me at ease, he played. That is how I heard the differences in the various pianos. Once the Schimmel was in my living room, he called to check, and, hearing the excitement in my voice, he said he knew my playing would come back. Roger understood. I shopped at Boston Piano and Organ in Natick (Yamaha Dealer), and Steinert & Sons in Boston (Steinway dealer). We fell in love with the tone of the August Forstergrand piano at Roger’s Piano. And it is just so gorgeous! We are so satisfied with the touch and tone of the August Forster. Our August Forster has become a member of the family! At the time we purchase it, although we feel we paid a very fair price, it seemed extravagant for two kids who could not even reach the pedals and were just starting to play. However, eight years later, they have grown into the piano and can really do it justice. I do think that playing on such a lovely instrument from an early age has made a huge difference in the level of commitment they have had year after year. They know that when they put the top up, they have to play their very best! The downside is that they don’t like to play on any other piano. When their friends come over, everyone wants to play our piano so we are lucky to hear a lot of talented young musicians! When we came into the store, we had our hearts set on buying a Steinway. However, Roger had us play several different pianos. We all agreed that we really preferred the sound and touch of the Forster piano even though we were previously unfamiliar with the name. We’ve never regretted that choice as it has proved to be the perfect match for our family! We wanted to let know how much we appreciated your work on our piano. We basically had given up the idea of turning our grand into a player piano. We checked into the possibility and were told by your competitors that it wasn’t possible. We were told that we needed to sell our Estonia and get a new player system already set up in their special pianos. Needless to say, we felt “stuck” because we loved ours. With the difficulty of setting us up with the wireless, so we could have 24 hour music, you didn’t give up! Your integrity was proven a number of times, even calling in another consultant until we were completely satisfied. We had our three children play and take lessons throughout their school years. We wanted to have the beautiful background sound of the piano playing even with the children gone. We wanted to enjoy the sound during dinner, when we have guests over, and for relaxation. Thank you, Roger, you and your staff’s expertise and professionalism made it work for us. Our piano was set up with your great system and we enjoy it even more than when our children played! I am a retired Rutgers University professor of History. I’ve won major book awards, published leading scholarly books, won the biggest fellowships available in academia, been visiting professor at Dartmouth and Canada’s Queen’s University. Besides this, I play the piano. I’ve owned several pianos and shopped at numerous piano stores over the decades and across America. Nina (my wife) & I decided we were ready for a truly fine piano. I did lots of research. 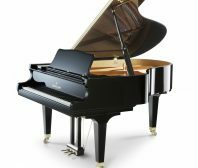 I contacted numerous piano retailers from coast to coast. We visited a dealer in Syracuse. We discovered Roger’s Piano by looking him up on the Internet. I called on a whim. Roger answered. I told him what we wanted. He said, “Doc, I happen to be unloading a 6’3” Schimmel Konzert Grand Belle Epoque at the moment! Brand new.” It was precisely what we were after. “Um, Roger, will you hold it for us? We’re driving to your store this weekend!” “Sure, doc, I’ll be glad to hold it!” “Roger, do you need a deposit?” “Nope, doc, no deposit necessary. See you Saturday–or Sunday, if you prefer. I’ll make sure I’m open, whenever you come. Just let me know.” For us it was a long drive. (We live in Upstate New York.) We got there early Saturday afternoon, the piano was gorgeous and all prepared (tuned, adjusted)–and I was so excited, I didn’t play it. Instead I played every other instrument he had on his showroom floor. I was ecstatic! Fabulous instruments! Schimmel. Vogel. Perzina grands (outstanding instrument!). On and on. Best inventory I had ever witnessed! Then I played the Schimmel Belle Epoque. I was in love! The entire time, Roger never “bugged” us. Never pressured us. In fact, he left us alone. Basically he said, “the store is yours. Play away!” He tended to other customers while we did just that: played away! (I also played all his uprights, a whole room full! Best upright inventory I had ever seen!) We played right up to the minute of closing time. Then, I wrote him a check. He had the Schimmel delivered to us within a week or two, delivered by a first-rate piano mover. And Roger has always been most helpful when I’ve had questions about the Schimmel, or our technician has had questions. (No, there were absolutely no problems with the Schimmel; it’s just that I considered tinkering with it in certain unauthorized ways. Roger gave me a well-deserved tongue-lashing for that stupid idea!) My wife, who could barely play a note, has been taking professional lessons on this Schimmel ever since–for 2 years. She’s now rather accomplished. She adores this instrument, as I do. Her piano teacher is a PhD in organ/music, on the faculty at the Crane School of Music (SUNY). Nina’s teacher adores this piano, as well. Our piano tuner/technician tunes all the Steinways at Crane (well over 100 of them), and he says this is the finest piano he’s ever played or tuned. He tells me I’m lucky he doesn’t live nearby, otherwise he would be over here, in my living room, playing Roger’s Schimmel every day. So, there you have the truth about Roger’s Piano. Roger Shaffer allowed Dr. Nina Pierpont and Dr. Calvin Luther Martin to realize a dream of a life-time: to own a German, handmade piano–a Schimmel, no less! We are forever in his debt. This is a real review by a real customer who bought what is arguably the finest piano in the world from a man who knew his business inside & out and who was gracious, kind, funny, warm, professional, completely unpretentious, and generous. Do yourself a favor; go visit his shop. And play and play and play. You will be thrilled. Any questions about the authenticity of this review? Email me at rushton@twcny.rr.com. Or call me at (518) 651-2019 (Malone, NY).